We had a really good trip to Sedona! 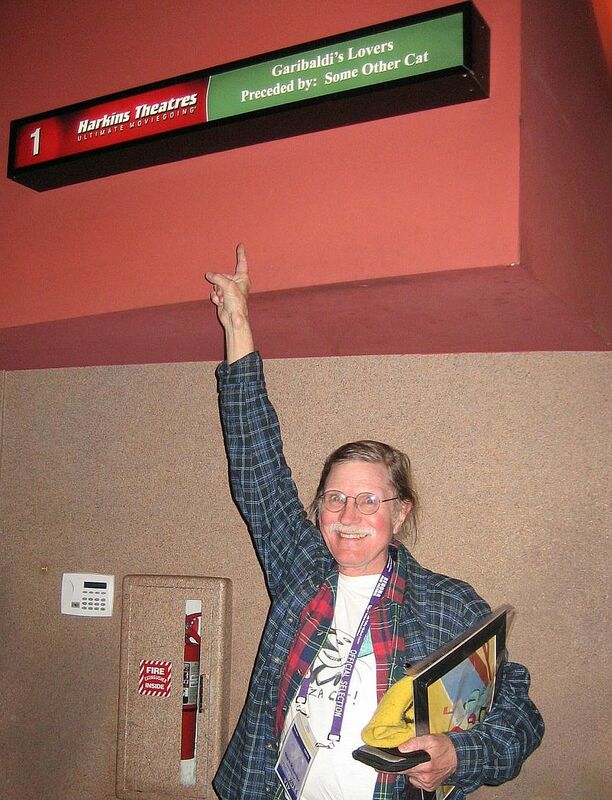 SOME OTHER CAT played at the Harkins Cinemas on 2-24 and 2-27-2014, that’s a happy cartoonist up there on the evening of 2-27, cel and muffler in hand. The cartoon looked really good on the big screen projected from a DCP . (Tiny aren’t they?) You can see the Festival screening report below with all the technical specs. 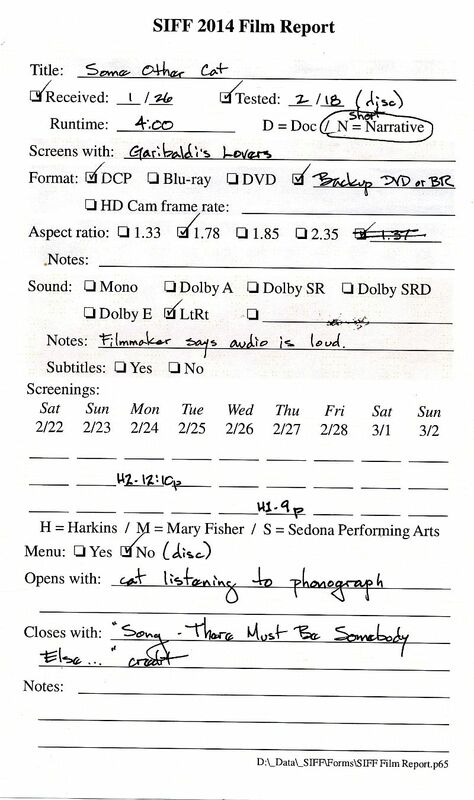 Note how thorough the Festival planners were, at the bottom of the form, “Opens with: cat listening to phonograph” (that’s Cathy’s background painting) and “Closes with: Song: There Must Be Somebody Else…credit”. At the first screening a trouble shooter came to my chair and asked me how I liked the projection, I just told them the sound was a little loud, and they noted it down! I’m not used to that level of care in showmanship from a Festival! The audience asked a lot of good questions after each screening, notably, “Why don’t more professional animators make their own films?” and “How did you get the feeling of musical rhythm into the cartoon?” I would have tried to sell some cels from “Some Other Cat”, but there just wasn’t any Festival store I could find or other venue that would have been appropriate. The Fest. put us up in the Poco Diablo resort in South Sedona, a beautiful room with a King bed, fireplace, wide screen TV and a flock of ducks at our sliding glass doors waddling across the 9-hole golf course! Room Service breakfast was delicious, we had it about three times. Allen Elfman of the Best of Arizona.TV website, interviewed me at the VIP center, and now thanks to him, and my webmeister Charles Brubaker, we have a link to the interview that Allen has so kindly posted: https://www.facebook.com/groups/300140486809331/ Head on over there and you will see a battered old cartoonist gamely trying to keep up with the dynamic Mr. Elfman. Enjoy! 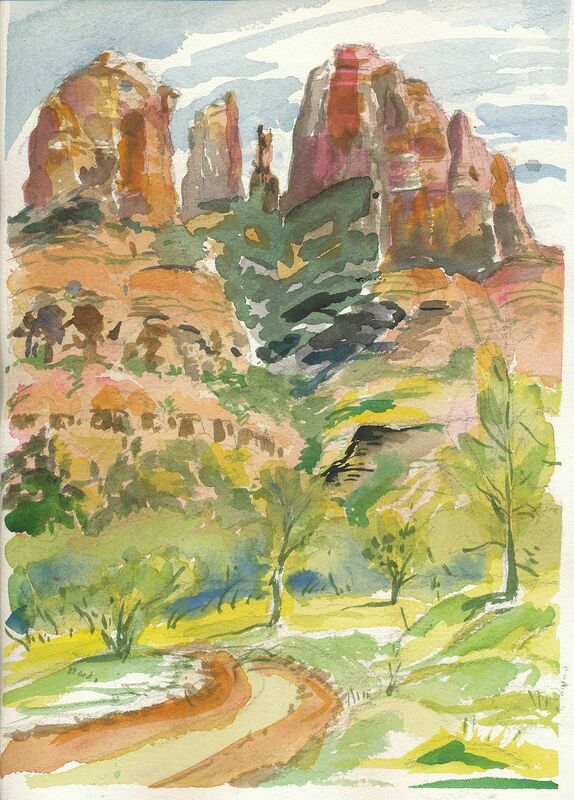 We managed about three painting excursions, this watercolor is from the first one. We stopped by the side of the road and painted the Cathedral Rocks formation. Cathy did an oil of the same formation, we enjoy painting together. Sedona is a breathtaking city which is very well integrated with the red rocks that surround it. Most of the buildings and even the sidewalks are the same earth red color that the looming rocks are. There is almost never a bad time to look at the rocks, they are beautiful in almost any light, any weather condition. There are a lot of intriguing art galleries and Mexican shops with mucho “Dio De Los Muertos” figurines on display, including a skeleton donkey. The Festival provided a lot of free meals at the VIP lounge, and threw a great awards brunch on March 2nd, in which Patrick Schweiss, the Festival director, made everybody laugh, winners and losers alike! Some Other Cat did not win any awards, but we were treated so well by the Festival that we purred! If any of you complete some short films (or features) in the future, consider entering the Sedona International Film Festival! On our last day in nearby Cottonwood, Arizona, your humble correspondent got on a horse named “Hawaii” and took an hour’s ride through the Dead Horse Ranch State Park. My guide and I saw two Bald Eagles sitting in a cottonwood tree as we walked past. I love riding at a slow walk and just experiencing beautiful landscapes from horseback. 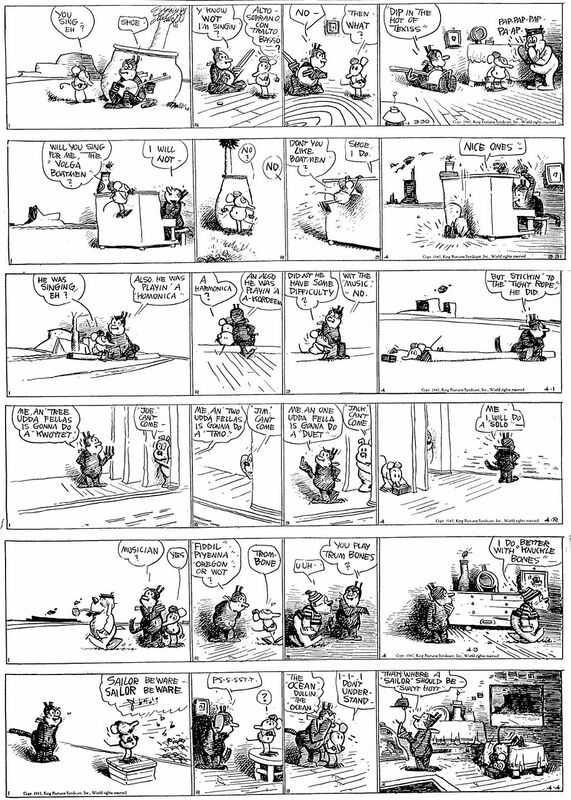 Krazy Kat is from 3-30 to 4-4-42 this time out. The subject of the week is singers and song. My favorite drawing is the last panel in the 4-2, as Krazy’s singing act is whittled down from a “kwotett” to a solo. The brick and Offissa Pupp need only be hinted at to get a laugh; as Ignatz reaches down for the brick, Pupp is barely visible waiting in the wings. Myrtle was originally published 12-22 to 12-28-1947. In this batch of strips, Myrtle carries on with Sampson and Snogg0ns, and in the December 25th strip, she tries to write the future in her diary concerning the outcome of her date with Snoggins, but finds out that she’s no Dreer Pooson. The Sunday page is very funny, as Myrtle pushes her head through a metal bicycle rack, and has to go to the town blacksmith to be free. I love the remark that Dudley Fisher has prepared for the horse to say. Felix is here from 3-19 to 2-25-1934. Felix brings a commission to “Rembrandt”, the artist he’s staying with, so he feels it’s time to return to Danny and Chip. Rejected oil paintings help him defend himself against unruly dogs, but it looks like a suspicious character is hanging out at the Dooit household. In the Sunday, Felix continues to get butted and bullied around by Taurus and Capricornus in his little journey through the cosmos. In a stunt very reminiscent of the silent cartoons, Felix glues together a stack of rocks to shinny down onto the next “star” or planet. We’ll pick up the next adventures very soon. This entry was posted on Wednesday, March 12th, 2014 at 1:01 am and is filed under Uncategorized. You can follow any responses to this entry through the RSS 2.0 feed. You can skip to the end and leave a response. Pinging is currently not allowed. Glad the screening went great! And that interview was neat, too. Sincerely pleased to see your excellent film is getting some due recognition!